The Leadership-Toolkit - Grow, Lead & Succeed! "1001 Proven Leadership Techniques, Strategies, Styles, Behaviors And Roles To Keep Your Fears From Holding YOU Back - Be the Confident, Decisive, Creative Leader You were Meant to Be, Now!" "Discover How To Influence, Persuade and Inspire Others to Generate Elegant Solutions, Add Value And Provide Outstanding Service!" If it is your desire to confidently guide others towards high levels of performance, if you want to decisively find and explore wise courses of action and you need to creatively solve problems that lead to new avenues of opportunity, then this might be the most important letter you'll ever read. Your Leadership-Toolkit is designed to build your confidence, strengthen your decisiveness and energize your creative abilities through hours of weekly "Live" consultations, thousands of proven leadership methods and strategies and hundreds of powerful exposures to world-class leadership-based skills training materials. In a word, your Leadership-Toolkit expands your flexibility, empowers your imagination and enhances the quality and value of your results! You'll thoroughly understand, practice and master each lesson at your own pace! Our world-class, proven, risk-free programs are built to enhance your learning and each one is based upon the core principles of W. Clement Stone's "Success-system that never fails"
Improves your leadership "activity-knowledge" in real-life situations! You'll maintain a positive mental attitude and change or modify your behavior to achieve better results! Inspire any group of people to work together in a productive spirit of harmony! Rapidly generate creative new solutions to any challenge, problem or opportunity! Forge long-lasting relationships with your clients, partners and associates! Improve the sharing and brokering of your power! Develop realistic project timelines and solutions to your most critical issues! Extend and strengthen your scope-of-influence within your profession and your organizational networks! Empower your people to produce value, quality and growth! Energize your team's creativity and entrepreneurship! Teach, educate and develop your people to be competent problem-solvers! Coach, counsel and mentor your followers to work-through and manage their difficult challenges! Nurture and leverage the "intellectual capital" of your human resources! Strengthen your 'emotional intelligence' and your own social capital! Transform your knowledge into potent sources of new ideas and opportunities! Forge your team's strengths into a synergistic, cohesive force! Explain, demonstrate and eloquently dramatize the impacts of decisions and new directions! Help people prepare for and overcome their challenges! Exhibit high levels of ethical conduct, maintain employee morale and sustain corporate goodwill! Provide superior service to your clients, partners and colleagues! 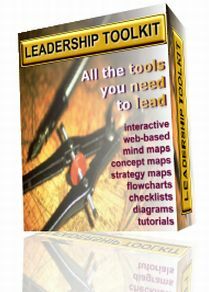 The Leadership-Toolkit is a uniquely powerful product. Your Toolkit is designed to last you a lifetime - with this one product, you will never stop learning, growing or succeeding. Although your Toolkit is web-based, it has tons of 'downloadable' tools, resources and materials too. Web-based means quick access to your Toolkit without having to wait for the arrival of a package through 'snail-mail' [postal mail]. All you have to do is point your web-browser directly to the Toolkit and begin your leadership adventure. In your Toolkit, there are hundreds of mini-workshops, expository papers, flowcharts and tables, tutorials, slide shows, and concept-/mind-/strategy-maps. So far, we've counted over 5001 tips, advice, wisdom, secrets and lessons inside your Leadership-Toolkit. And the Toolkit is still growing and evolving - we add substantial amounts of new information and proven knowledge to the Toolkit every month. We support your leadership development with 'live' consultations and discussions with your Toolkit author [that's me, Bill Thomas] and with my guests who are experienced leaders. Each week, you can tell me about your challenges and together, we'll find solutions, strategies or tactics. Every week, there are 8 hours when I am personally available to you, to speak with you and to help you. You can also post your questions or comments in the private Instructor-supervised discussion forums. You have the opportunity to enroll in special 30-day email tutorials - where you can go on the "Inner Journey of Leadership" or learn how to "Boost the Value of Your Leadership Contributions"
Your Leadership-Toolkit solves your needs to empower your skills, produce profits, and enhance your leadership qualities - it truly contains "All the Tools You Need to Lead and Succeed"! Listen to what some of our customers say. Fmr. Chairman - NJ Chapter of American Society of Training and Development - "Your methods and techniques would work in most organizations, truly effective and revolutionary"
"The workshops and training manuals helped us to successfully launch and manage our entire network support service rollout with minimal disruptions." Director of Training - International Professional Engineering Association - "An impressive series of results were achieved through your innovative solutions and professional workshop leaders. Thanks for making me look good for choosing your company." 1: Your training must give you a risk-free, iron-clad, performance-based guarantee - you should always know how confident your training providers are about their ability to help improve your leadership skills. 2: You should always get course materials presented to you in different modes or media types, such as, Visual, Kinesthetic and Aural. Your lessons must empower you to learn new subjects using the "spaced repetition" method - just a few minutes every other day will boost your understanding in a shorter period of time. 4: You must have opportunities to play, work or experiment with the concepts, principles and procedures of leadership. That way, you can practice, refine and master your newly-acquired skills. 5: Your program should be supported by Coaches and Mentors for at least 2 hours every week [your Toolkit gives you up to 8 hours of weekly 'coaching and mentoring' time]. Your Instructor, Coach and Mentor could comment on your progress. point out how well you are doing and influence what is happening to your growth on a week-by-week basis. 6: Your training program must allow you to spend extra time on your toughest demands and most productive opportunities. Because of real-life challenges, you deserve a flexible, and adaptable educational experience. You and I know that many so-called "continuing education" courses really stop developing, educating and supporting you right after you complete your class sessions. After all, you do have to live in the real world - and you want to be able to use all of the things that you've learned when you face your first, second and even your 100th crisis situation. You probably could you use a reliable, continuing, long-term, permanent educational program that keeps-on nurturing, coaching and training you over-and-over-again for years. Because you deserve a complete solution for your leadership development and growth - you need a program that is simple-to-use, easy-to-work-with, and stays-with-you-all-the-way. This unique, web-based, interactive "toolkit" uses concept, strategy and mind maps to guide you through the hundreds of content-rich, knowledge-focused, action-oriented chapters of diagrams, checklists, flowcharts, presentations and tutorials. The Leadership-Toolkit literally contains over 5001 proven strategies, techniques and processes, I personally devote 8 full hours every week to your development with our consultation service and this program gives you additional support through our special month-long tutorials - normally, I would be forced to conduct classes with a minimum number of attendees, who would have to commit to six months or longer and I would charge over $5000 per person for that six-month program. But thanks to Tim Berners-Lee and the Internet and all the latest Web-based communications services, we can now offer substantial reductions in our prices. You will be able to save on our travel-related costs, and the costs of an exclusively dedicated professional sitting in your home or office. Plus, there is no need to require a minimum number of students for this truly self-directed, "life-long", blended-learning program. The Leadership-Toolkit is filled with thousands of proven best practices, world-class expertise, and action packed pages that are loaded with all the tools you need for the successful practice of leadership. Subscription to The Leader's Edge - our special advisory focuses on the very best-in-class resources, tools and services for leaders. If you respond right away, you pay only $97 $49.95. 3 full months of access to our web-based Leadership Answer Center with its weekly consultations, Instructor-led discussions and 30-day in-depth tutorials! Strategic Meditations for Leaders - to boost your personal motivation, enrich your soul and elevate your spirit! 3-month subscription to The Leader's Edge - our special advisory focuses on the very best-in-class resources, tools and services for leaders! Using the Language of Leadership for Public Speaking - 51 ways to make more powerful, greater impact, persuasive speeches! 21 Principles for discovering, evaluating and exploiting New Opportunities and Better Solutions - mind, concept and strategy maps of processes, methods and approaches! Self-directed Learning Strategies and Techniques for Executives and Leaders - a 25 page Report with checklists and flowcharts! The Leadership-Toolkit has our iron-clad, no-nonsense, no-questions asked, no-hassle, no-problem-getting-your-money-back guarantee. If at anytime during your ownership you feel that the Leadership-Toolkit has failed to help you grow into an effective, nurturing and inspirational leader, we will return your money back to you. Why such a strong guarantee? Because you will see benefits as soon as you start putting your new learning to work. Of course, it will take time for you to begin to realize the full potential of this extraordinary toolkit. However, while there are no quick fixes, we believe that these permanent changes will positively improve your life forever. You don't have to decide now if the Leadership-Toolkit is for you. Just get it and try it out. If it doesn't do everything I say and more, if you don't save money, or if your career and business prospects don't improve, or if your life isn't better, or if you don't absolutely love it, just let me know and I'll give you every cent of your money back! So you have nothing to lose and everything to gain. What you receive for your money is instant access to our web based training program and the downloadable documents. This online program is completely compatible for both Windows and Mac users. After ordering you are given a unique access username and password so you can login and start using your Leadership-Toolkit right away. If you decide in the future that you don't want to use the program anymore, it's easy to cancel it. Get Instant Access To The Leadership-Toolkit! It's easy to order the Leadership-Toolkit Training and Development Program. Just click the link below to enter your details. Once your order is processed you'll get instant access to the online Toolkit and begin developing your leadership skills in minutes! Our secure server accepts all major credit cards. Click to ORDER Via Our SECURE SERVER! Managing Principal - Mustard Seed Investments, Inc.
P. S. The Leadership-Toolkit is a set of web-based tools which employ proven training techniques so that you can use the Leadership-Toolkit as your personal treasure chest for continuous growth and enhancement for your leadership training needs. Now, you can learn, nurture and empower your leadership talents at your own pace - and then practice each concept in your 'real-life' situations, challenges or events, too. We are not kidding, this crazy low intro price for the Leadership-Toolkit will absolutely and positively expire very Soon! P.P.S. Remember, The Leadership-Toolkit is designed to be your friend forever. It will be the constant, well-thumbed, most used resource in your cyber-bookcase. You will have additional advice, counseling, updates and tips from leadership experts, coaches, mentors and tutors, and me, Bill Thomas, available to you. Acquire your Leadership-Toolkit today! Copyright © 2003-2005 Mustard Seed Investments Incorporated.